Peninsula Is Part Of Lorell Essentials Series Laminate Furniture With High-Quality Laminate Construction And Metal-To-Metal, Cam-Lock Connections. Peninsula Comes In Two Boxes, And Llr69381 Must Be Ordered Separately For A Complete Unit. Use The Peninsula To Extend Worksurfaces And Create Configurations To Make The Most Efficient Use Of Your Office Space. Walnut Laminate Top Is 1" Thick For Durability. 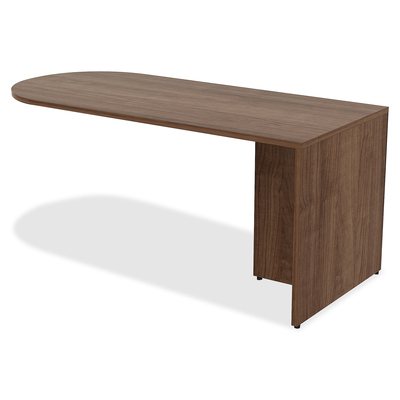 Design Also Includes 3mm Pvc Edges..
Peninsula Is Part Of Lorell Essentials Series Laminate Furniture With High-Quality Laminate Construction And Metal-To-Metal, Cam-Lock Connections. Peninsula Comes In Two Boxes, And Llr69381 Must Be Ordered Separately For A Complete Unit. Use The Peninsula To Extend Worksurfaces And Create Configurations To Make The Most Efficient Use Of Your Office Space. Walnut Laminate Top Is 1" Thick For Durability. Design Also Includes 3mm Pvc Edges.